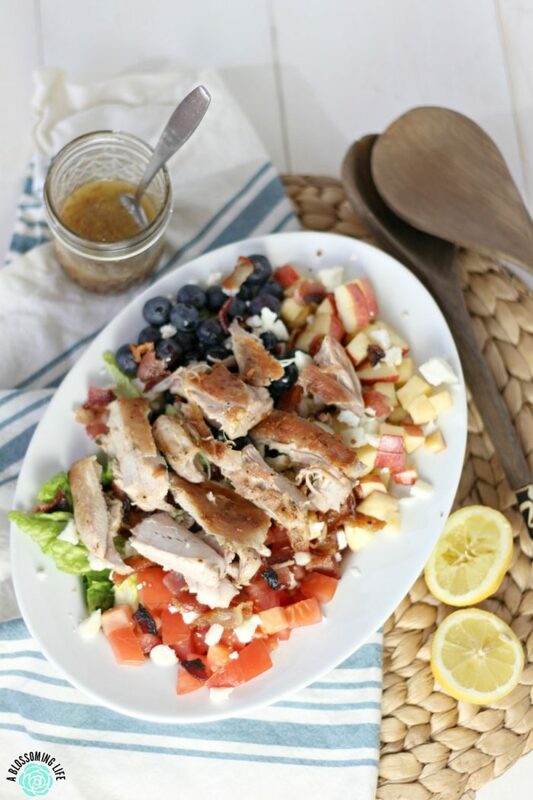 This homemade chicken, bacon, blueberry, and apple chopped salad with honey mustard dressing is a delicious and healthy salad with good crunch. 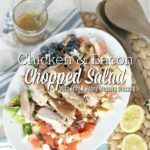 Sweetness from the fruit, creaminess from the cheese, and crunch from the bacon and lettuce, this salad is a fulfilling dinner or side. Salads out at restaurants are the best. Even just the side salads are way better than the ones I usually make at home. Usually, a salad around here is just a side thing thrown down on a plate when we need an extra vegetable (and it happens to be lettuce season). Not a whole lot of substance or delicious flavors – just boredom on a plate. A second thought really. But since it is still lettuce season, I decided we should have a large salad as the main meal for dinner. This baby really hit the spot. And it made me realize what my super boring salads have been missing this whole time… different textures and flavors. What Makes A Tasty Salad? Dressing doesn’t just make the salad. No, it is all the ingredients combined into something outstanding. All of the ingredients add their own uniqueness to the dish. Bacon… need I say more? Kidding, of course. 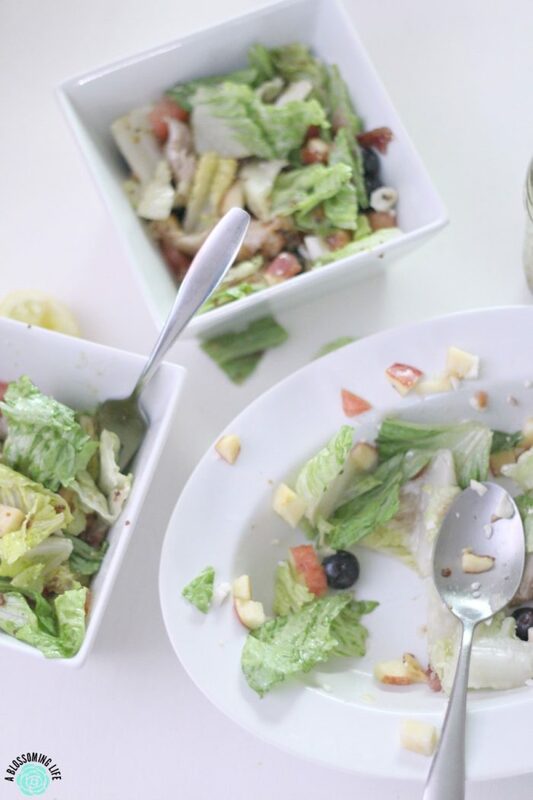 Bacon adds a salty crunch, blueberries add a sweetness, apples add a sweet crunch, tomatoes add a little tang, the cheese adds a sharp creamy taste, and romaine lettuce adds extra crunch. Then you top it with a zesty and sweet honey mustard dressing… YUMMMM. Even my almost-2-year-old loved it. We basically give her all the ingredients, minus the chicken (she’s allergic). She picks through all the lettuce and puts it over to the side. We don’t make a big deal and just keep giving it to her knowing she won’t eat it. Maybe one day she will. This week was not the week though, and if lettuce (and mushrooms) is one of the few healthy foods she won’t eat, then oh well. She’s not picky and will eat just about anything. Give the girl some beans and she will devour the entire bowl. 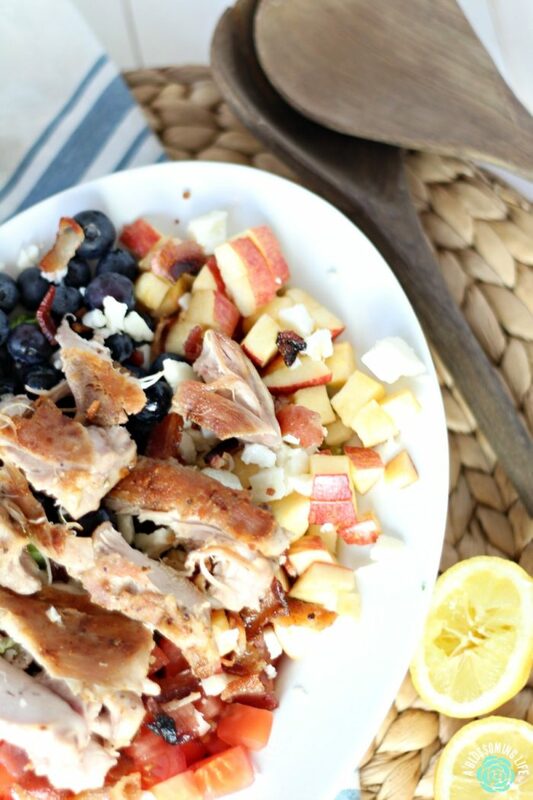 This homemade chicken, blueberry, and apple salad with honey mustard dressing is a delicious and healthy salad with good crunch. Sweetness from the fruit, creaminess from the cheese, and crunch from the bacon and lettuce, this salad is a fulfilling dinner or side. Heat a large skillet on medium-high heat. Pat chicken down with paper towels on both sides and season with salt and pepper on both sides. Once pan is nice and hot, add chicken and bacon strips. Cook 2 minutes and turn heat down to medium-low. Cook for about 5-7 minutes and flip and finish cooking other side about 5-7 minutes. Flip bacon strips and cook until crispy but not burnt. While chicken is cooking, chop ingredients and place in a large salad bowl. Make dressing by placing it in a container and whisking all the ingredients together. Once chicken and bacon are done cooking, crumble the bacon, slice the chicken, and place on top of the salad. Top with dressing and toss. I’ve been working hard to improve my photography skills, but some days it just doesn’t happen. I took those pretty pictures of the salad and then we were starving so we demolished it. Midway through eating I realized I should’ve took a photo of it dished up. So of course my hubby tell me just to take a quick photo. So here’s a photo with no staging, prepping, and terrible lighting. 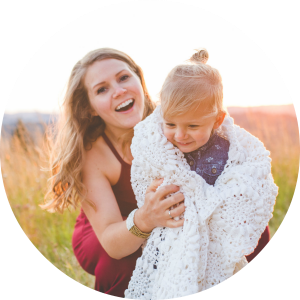 Brings back so many memories of old photographs here on the blog. It’s so bad I had to make it smaller so it didn’t look so grainy. We can’t be perfect all the time right?